A new report on transport and the environment shows that emissions of many pollutants from transport fell in 2009, but this reduction was most likely only a temporary effect of the economic downturn. This means that a more fundamental shift in Europe's transport system is now needed, so that emissions do not increase even in times of strong economic growth. The latest annual report on transport emissions from the European Environment Agency (EEA) covers issues such as energy consumption, emissions, transport demand, price trends and fleet monitoring. It also considers a set of quantitative targets proposed by the European Commission's 2011 roadmap on transport (see AN 2/11, p. 6). The report shows that there are significant opportunities for policy makers to coherently address environmental issues connected with transport, for example by addressing air quality and climate change together. Some efficiency gains have been made in the transport sector. But these relatively modest gains are often outpaced by growing demand, even if the recent economic recession temporarily slowed activity in some areas. Between 1990 and 2009, demand for transport grew by approximately one third, leading to a 27 per cent increase in greenhouse gases (GHG) from transport in the same period. 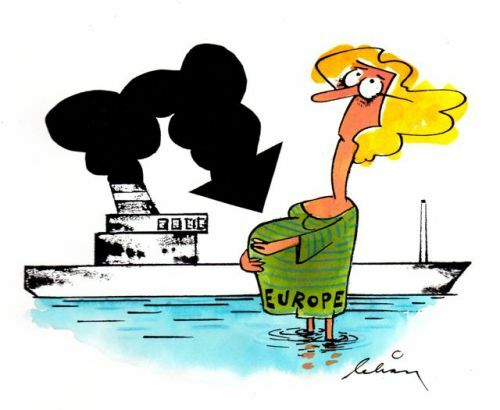 Overall, transport was responsible for 24 per cent of EU GHG emissions in 2009. The roadmap states that EU member countries must reduce GHGs from transport by 60 per cent by 2050, compared to 1990 levels. Since emissions actually increased between 1990 and 2009, the EU must make an overall 68 per cent reduction between 2009 and 2050. While annual energy consumption in transport grew continuously between 1990 and 2007, there was a drop of four per cent over the period 2007-2009. The upward trend is likely to resume with economic growth, however. In spite of progress since 1990 in reducing the emissions of many air pollutants from transport, EU air quality objectives are still exceeded in many areas. For nitrogen dioxide (NO2), the annual limit value was exceeded at 41 per cent of traffic monitoring stations in 2009 and the daily limit value for particulate matter (PM10) was exceeded at 30 per cent of the traffic sites across the EU. Road transport in particular makes a large contribution to urban air pollution. Noise from transport sources is a significant environmental problem. Almost 100 million people were exposed to damaging long-term average levels of noise from road vehicles on major roads. Evidence published by the World Health Organization (WHO) indicates that at least one million healthy life years are lost every year in Europe as a result of noise from road traffic alone. Roads, motorways and railways are cutting up Europe's landscape into ever smaller parcels, with serious consequences for biodiversity. It is estimated that nearly 30 per cent of land in the EU is moderately, highly or very highly fragmented, restricting the movement and breeding of many different species. Over the last few decades, the application of technology has been the primary method for reducing the environmental impacts of transport, and technology has also been identified as the most important means to achieve the Commission's target of a 60 per cent GHG reduction from transport by 2050. But technical solutions alone cannot achieve this target. Demand optimisation, including modal shifts, will form an essential part of meeting this target, and can be very cost-effective as well as offering environmental co-benefits, such as air quality improvements and noise reduction. The report includes a chapter on carbon dioxide (CO2) emissions from cars, and before the end of this year EEA will release updated data on manufacturers' progress towards CO2 targets for new cars.